Last year's Canon T4i is a really excellent camera. But for all its whiz-bang features like a capacitive touchscreen and continuous autofocus while shooting video, it just didn't feel special. A DSLR for beginners just doesn't make as much sense when there are smaller mirrorless cameras that can achieve similar results. So Canon shrunk the T4i down. Here's the mini version, Canon EOS Rebel SL1. With the exception of its size the non-tilting capacitive touchscreen, the SL1 is identical to the T4i. Same 18-megapixel APS-C image sensor, same DIGIC 5 image processor, same 1080p video recording with continuous autofocus. The SL1's body weighs just 14.1 ounces compared to the T4i's 18.3 ounce body. When you're holding this thing, you can believe how light it is. And it's noticeably small too, measuring 4.6 x 3.6 x 2.7 inches compared to the T4i's 5.2 x 3.9 x 3.1 inches. 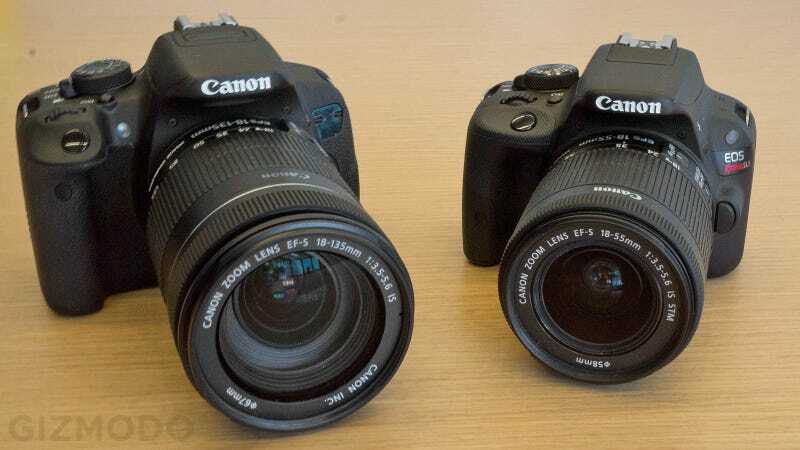 Here's what that size looks like compared to the T4i and mirrorless Canon EOS M released last year. All three of these cameras have the same image sensor and image processor. The Canon SL1 will be available next month for $650 for the body alone or in a kit with a brand new 18-55mm STM lens. (It's got the same good-for-video stepping motor technology as the 18-135 STM lens introduced with the T4i last year.) That's cheaper than a T4i, but still not quite as cheap as the tiny $600 (lens-included) SLT-58 from Sony. It'll be available at the end of April.